We all love a good, inspirational boxing film and judging by the trailer, Hands of Stone looks like it could deliver the goods. On the other end of that though, could it be just another typical Rocky-style boxing film? I don’t know enough about the boxer Roberto Duran, except that he’s one of the legends of the sport and I’m assuming his story is one worth telling. The film stars Robert De Niro as Duran’s trainer Ray Arcel and he appears to be in top form in a role that De Niro could play with his eyes closed. Edgar Ramirez plays Duran and definitely has the look of a boxer so we’ll see how his performance holds up, though he is a credible actor. One of the stranger casting choices was having hip-hop star Usher playing Duran’s rival Sugar Ray Leonard. In my opinion it’s not a good idea casting a musician in an acting role, but obviously the filmmakers have seen something in him, so it’ll be interesting to see how he goes. The film is directed by Jonathan Jakubowicz who only has a couple of other foreign language film credits. 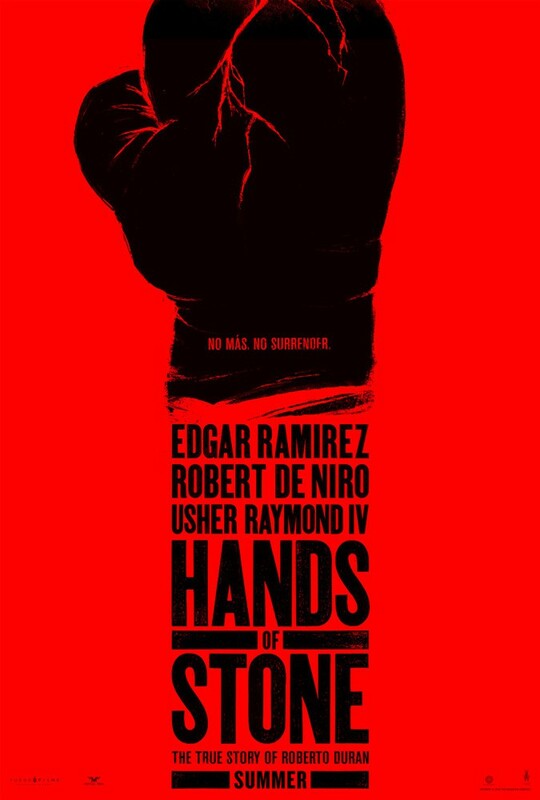 Hands of Stone is due out on 26 August 2016 in the USA, check out the trailer and poster below.